“I’ve come up with a new recipe!” — a phrase familiar to anyone who has played Final Fantasy XV. Coined by one of the game’s main characters, Ignis Scientia, a chef who would boldly exclaim this infamous phrase any time the player found a new ingredient. As Prince Noctis and his loyal Crownsguard travel across the Kingdom of Lucis, Ignis’ catch phrase can be heard on a more-than-regular basis. Now, some die-hard fans of the royal chef have taken it upon themselves to bless our world with Scientia’s magical cookery. Led by Reddit user Aranea Highwind, a group of Final Fantasy fans have created an unofficial cookbook recreating all sorts of recipes from the game. Below is our interview with the project leader of That’s It! The Unofficial FFXV Community Cookbook. Enjoy! Brandon Takeda: How long has the project been underway? Aranea Highwind: The project has been underway for about 10 months, on and off—since February! BT: Have you worked on any large community projects before? BT: How did you find yourself in a leadership role with the community project? AH: It just kind of happened, to be honest. After seeing some posts on Reddit expressing a desire for a cookbook, I went ahead and made a few humble threads on the site asking for volunteers. Starting out, I thought the end result would be a small cookbook with 10-15 recipes, but things really picked up steam when I realized just how many fellow foodies were out there, both on Reddit and other sites. BT: Lots of fans often look to cosplay, fan-art, or more traditional mediums for an homage. What was it about the idea of a cookbook that resonated with the group? BT: What were some challenges in orchestrating this many people to collectively produce the cookbook? AH: Keeping track of the 50+ people involved, the recipes they’ve signed up for, and the recipes they’ve submitted—without getting recipes mixed up—has been a little overwhelming at times, to be honest. Google Drive/Sheets has been a godsend for organizational purposes. I’ve also basically memorized the names of everyone involved, their social media accounts, and the recipe(s) they’ve contributed. BT: There’s no small amount of recipes here. Were chefs left to their own devices while cultivating the dishes, or were they encouraged to start with already established recipes? AH: Chefs were encouraged to do whatever they felt the most comfortable with! Many of the dishes in-game are very similar to real-life dishes, so a lot of folks were definitely inspired by existing recipes. But others, especially the more experienced cooks, struck out on their own. What is really cool is that because chefs come from all over the world, some of them added local flair to their recipes! Martha is from Mexico for example, so she made a super awesome “street-Mexican-style” recreation of the Crispy Fish Fritterwich. And Onionchoppingninja is Singaporean, so her Peppery Daggerquill Rice recreation (cooking time: 3+ hours!) is an amazing authentic Hainanese Chicken Rice recipe. BT: Obviously not all the ingredients used in the video game are… real. Did this pose any particular issues? BT: Was there a highly coveted recipe that everyone wanted to replicate? AH: A shocking number of people were interested in replicating the Veggie Medley Stew! Noctis would be horrified. BT: What happens after a recipe has been selected for recreation? Can you briefly walk us through the contribution process? If someone were considering a contribution, how would they go about getting involved? AH: Great question! 🙂 I maintain a list of recipes that have yet to be claimed here. If anyone is interested in recreating a dish, all they have to do is message me in advance on Reddit, Twitter, Instagram, Tumblr, or Facebook, I’ll claim the recipe for them, and give them a couple weeks to make the dish. They’ll send me pictures and a recipe when they’re done, and then I’ll standardize the recipe (for example, making sure ingredients measurements are in both imperial and metric) and make sure they’re happy with the final product. Then it ends up in the next iteration of the cookbook! BT: Besides additional recipes, are there any other planned changes in store for the cookbook’s fourth iteration? AH: The fourth iteration of the cookbook is special because I hope it’ll cover every single recipe that Ignis has discovered in the game so far! I’m still brainstorming, but it may also include some indexes (by food type or difficulty, for example) and printing instructions for anyone who wants their own physical copy. The printing instructions would act as guidelines for making the final product as beautiful as possible, because wasn’t actually designed for a 8 x 11.5 page! BT: The cookbook has already accrued considerable reach, the English voice actors for both Noctis and Ignus even tweeted about it. Are there any particular points of pride for the cookbook collective? AH: Every time a new version of the cookbook has been released there has been a cause for celebration amongst the cookbook collective! After all, each version is the result of the effort and hard work of numerous people and it’s exciting to see everyone’s recipes in a prettified PDF format. As a side note I’m also definitely super grateful to not just the English voice actors, but every single person who’s shared the cookbook on social media and spread the word. BT: What would be a good recipe to start with for beginners that want a little bit more than Cup Noodles? AH: The Nebula Salmon Teriyaki (by Victoria) and the Prairie-Style Skewers (by ffxvrecipes) are fun and delicious starting points for beginners, because they are relatively quick and oven based! BT: Out of everything found in the cookbook, what’s your favourite recipe? All joking aside, every time I try a new recipe from the cookbook I get a new favorite. So I’ll have to get back to you when I finally make my way through the entire thing! BT: Do you have anything you’d like to add? AH: I just want to thank everyone who’s contributed to the community cookbook so far, as well as everyone who’s taken the time to read it. I hope you’ll enjoy trying out some new recipes! We are still seeking a few additional recipes for the final version of the cookbook, so if you’re interested in participating, please feel free to reach out! Those looking to reach out or get in touch with Aranea can do so via the Twitter. 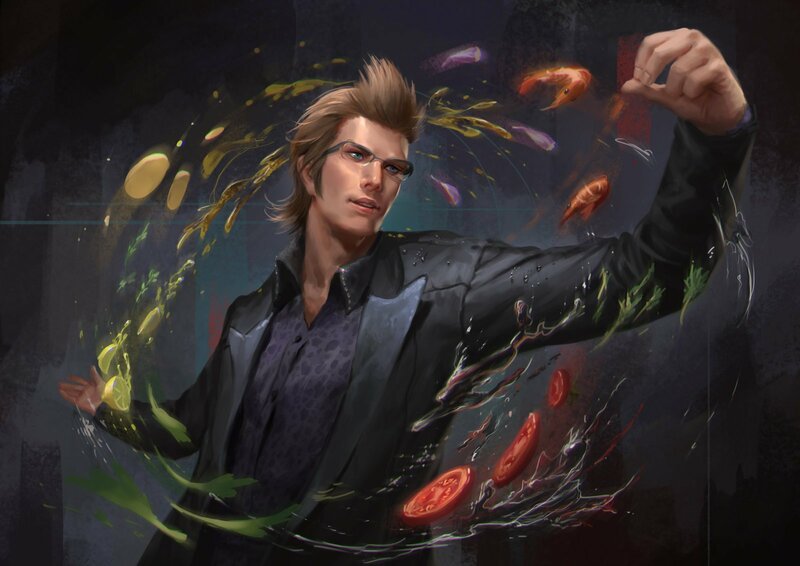 If you’re curious, or feel like taking a crack at one of the recipes, you can head on over to /r/CookingWithIgnis and see what’s cooking for yourself!